Many things can cause low back injuries--muscle strain or spasm, sprains of ligaments (which attach bone to bone), joint problems or a "slipped disk." The most common cause is using your back muscles in activities you're not used to, like lifting heavy furniture or doing yard work. Overusing your back or not having a supportive mattress can also cause lower back pain. 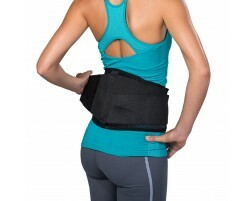 To treat lower back pain, limit the amount of heavy lifting and bending of the back, use ice back wraps to relieve pain and inflammation, and wear a back brace to fully support your back during your injury as you heal. If you need help selecting a low back brace, try our guided tool, Brace Advisor, for recommendations based on whether you are looking for injury prevention, have an existing lower back injury and your desired activities.